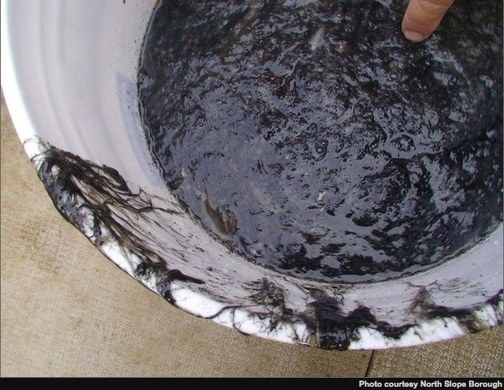 A gigantic smear of gooey, black biological material is making its way through the Chukchi Sea between Wainwright and Barrow in Northern Alaska. Eyewitnesses say its definitely a living entity, though unlike anything theyve seen before. Closeup shot below. The blob was first spotted last week, floating in Arctic waters. Big chunks of it – some as much as “12 miles long,” according to the Anchorage Daily News, are drifting through the sea. A helicopter tracked the spread of the goop for 15 miles and saw no end to it. So far, none of unknown substance has touched shore. Its certainly biological. Its definitely not an oil product of any kind. It has no characteristics of an oil, or a hazardous substance, for that matter. Its definitely, by the smell and the makeup of it, its some sort of naturally occurring organic or otherwise marine organism. in recent history I dont think weve seen anything like this. Maybe inside lakes or in stagnant water or something, but not in the ocean that we could recall … If it was something wed seen before, wed be able to say something about it. But we havent. [The stuff is] gooey [and dark]. Its pitch black when it hits ice and it kind of discolors the ice and hangs off of it. It kind of has an odor; I cant describe it. Is this the creature described in io9s mad scientist contest from last year? Perhaps a relative of the North Carolina sewer monster? Or is it just a massive algae bloom? The Coast Guard says theyre getting it examined and test results will be back in a week. 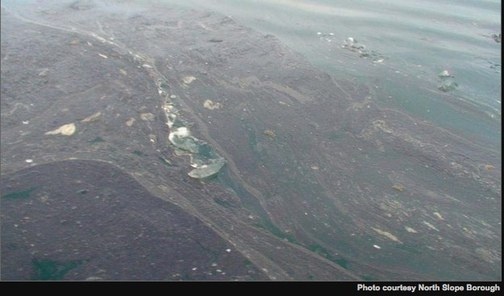 via Unidentified Biological “Goo,” 15 Miles Long, Creeps Down Alaskan Coast – Monsters among us – io9.